The thought of Greg solo was enough to make me buy tickets for four shows (and see three), and I would have done more had I been able to manage it. The thought of Greg onstage all by himself, or at least outside the encumbrance of an organized musical vehicle (even if he was in the driver’s seat) was just so – appealing, so tempting, so frought with potential and anticipation. Reality didn’t disappoint, but it was tighter, more organized, more disciplined. The setlist did not vary all that much, with a wide selection of material across his musical history. The variation came with the appearance of various guests, from a drummer (Greg Wieczorec, who played on Powder Burns) , to Mark Lanegan and Petra Haden, to John Curley Himself turning up in Cincinnati (as well as all of the West Coast shows). The New York show was triumphant, feeling like a tour starter or some kind of celebration. The audience applauded every song, exhaled equally breathlessly for “Bonnie Brae” as they did for “What Jail Is Like”. I was almost sad that there were drums, because it made it more traditional and less a departure (and I had to wear my earplugs). I was watching baseball playoff scores inbetween songs and was thrilled to listen to him salute Cliff Lee and diss the Yankees. It was emotionally thrilling and exhausting, so much so that I passed on heading to Philly the next night. The surprise was spoiled early in Seattle when opener Shawn Smith told us that John Curley was there. He’d been in LA and SF and we had hoped he had made it up to the Pacific Northwest, but didn’t count on anything. 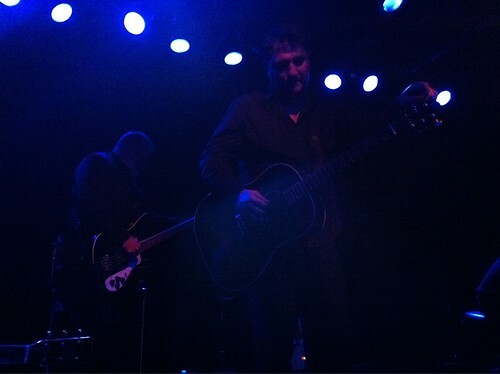 The response as he walked onstage in Seattle was tumultuous nonetheless, despite the early warning.The looks between Dulli and Curley made you want to weep and smile so hard that your face hurt, all at the same time. He played through the Whigs portion of the set, sounding like the John Curley you knew and loved even if he had greyed elegantly around the edges. By the time he had left the stage, I announced to no one in particular that I needed a cigarette after that; Greg overheard and laughed, feeling the same way. Portland, at the Doug Fir, was the end of the road and promised to be off the charts; he’s done two-night stands at the venue before and you couldn’t blame us for hoping that there’d be a little deviance on the menu. Greg suffered from monitor issues during the first few songs, which was resolved by the placement of a large wedge in the middle of the stage, which he then worried about tripping over. He regained the emotional intensity later but it was nowhere near as strong as Seattle. There was no announcement of Curley’s presence so when Greg said, “From Cincinnati, Mr. John Curley” there was a venue-wide gasp as he walked out onstage. Portland was a little looser than the other two shows, with some definite Whigs-ian moments, like tagging “La Grange,” followed by “Shake Your Hips” at the end of a song, launching into “Love, Reign O’er Me” before starting “Teenage Wristband”. I love all of that, the references and the nods and the flashbacks, but always feel like it’s selfish to celebrate the inclusion of someone else’s songs into a set. But the Whigs songs weren’t the only notables on this tour – Gutter Twins without Lanegan had a different, ethereal intensity, and “Forty Dollars” was as much of an audience singalong as “66” was, “Candy Cane Crawl” equally as heartbreaking as “Let Me Lie To You.” Grown-up Greg does not disappoint; the records have only gotten better. This is why while I would love nothing more than to see Greg, John and Rick McCollum onstage again, I’ve also been perfectly happy in my Twilight Singers/Gutter Twins post-Whigs existence thus far, and selfishly don’t need that to end. More Twilight Singers in February. See you then.